POSTER ASSIGNMENTS. Find your poster number, time, and date. but will be recycled if not collected by 16:00 on Friday. DIMENSIONS. 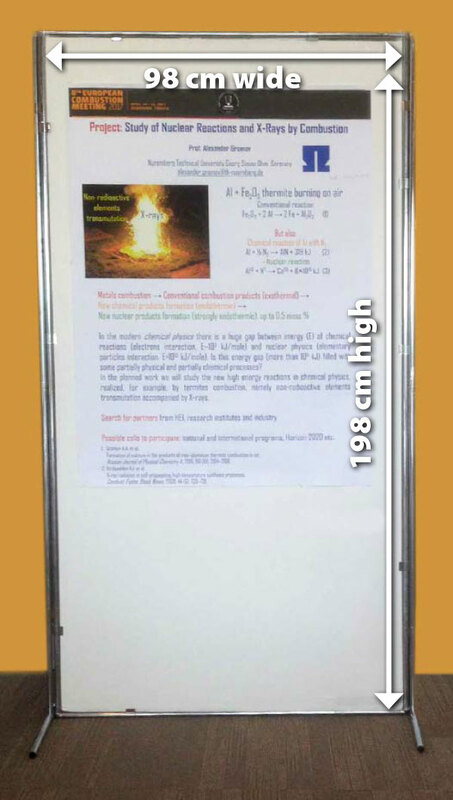 All posters will be mounted vertically, and the maximum size of finished posters must not exceed 98 cm wide × 198 cm high in order to fit within the usable area of the poster stand. Posters printed in sizes A0 and B1 in portrait orientation can fit easily on the board. Please note, these poster stands sit directly on the floor, as shown in the photograph to the left. MOUNTING. Adhesive squares (Patafax) will be available on site to mount posters to the poster stand. A poster number ID card (14 cm high x 22 cm wide) will be mounted on the display area of each poster board. You may temporarily remove this card and affix it on top of your poster in the upper right corner, if desired. PRESENTING YOUR POSTER. Presenters are required to stand by their poster, and be available for questions and discussion with conference participants for at least one hour during their assigned poster session. The poster sessions provide an extremely valuable opportunity to discuss your results and ideas with colleagues. We realize, though, that you may not always have the opportunity to connect with colleagues interested in your poster during a busy session. To remedy this, a card where you can write details about additional times you will attend your poster will be provided. PREPARATION TIPS. Posters should be prepared with clarity in mind, using easy to read fonts and font sizes, with a title that will be easily visible from 6–7 m away. Text should be kept to a minimum, and the main messages and conclusions conspicuously presented. Please avoid the use of red on green and vice versa to ensure that conference participants with difficulty differentiating between these colors are able to read all poster content. The Oceanography Society provides an excellent guide titled Scientifically Speaking which provides advice on preparing both poster and oral presentations that can be accessed here. VAT is included in the price. Inquire with AB Grafika for questions regarding other sizes. Due to the anticipated large number of requests, submit poster files as early possible. and remember that posters must be picked up on Saturday, October 6, or Monday morning, October 8.